A vast, desolate wasteland with no shelter on the horizon. A man at the end of his wits carving one word, his worst fear, into a stray log: Lost. A trickling creek breaking up the hopeless landscape. The camera pans up, and all we can see are a few women gathering water in slow motion-except then we realize there is no camera gimmickry going on here; the women are simply burdened by the weight of their own weariness. These are the shots that open Kelly Reichardt’s Meek’s Cutoff, and they set the pace, tone and themes of the film in motion without ever uttering a word. Meek’s Cutoff is as difficult to watch as the terrain its characters traverse, its painstaking journey is incredibly rewarding. Plot matters in this film, and as such it is my duty to inform you of a few basic details, but these are secondary to atmosphere and mood. A group of travelers are journeying west, and their guide, the titular Stephen Meek, seems to be lost. Meek promised to take the group through a shortcut of sorts, but as the unchanging horizon begins to erase any markers, they find themselves ever more deeply ensconced in the oppressive desert. Before too long, they run out of water (the shots near the beginning are the last time they get to refill their jugs), and without a proper guide, one of the couples begins to lose their grip on their surroundings. Meanwhile, an American Indian is stalking them for some unknown purpose, and upon realizing this, the group of pioneers tries to capture him. They believe that he can lead them to water, but that belief is born out of their unparalleled desperation. Meek’s Cutoff along with some other recent films (Tree of Life, Uncle Boonmee) has been at the center of a debate currently taking place among our nation’s film critics. On one side, some folks believe movies should be entertaining first and foremost, that slow movies without much plot have little business being made, as no one really wants to see them. On the other, people like movies which aspire to something greater, something beyond the mere creation of laughs and ticket sales. I stand firmly on the side of the latter, in that I think those movies are the bread and butter of great cinema. I enjoy blockbusters perfectly fine, and actually think better of them than some of my more opinionated friends, because I think enjoyment is a valid attribute of a film. 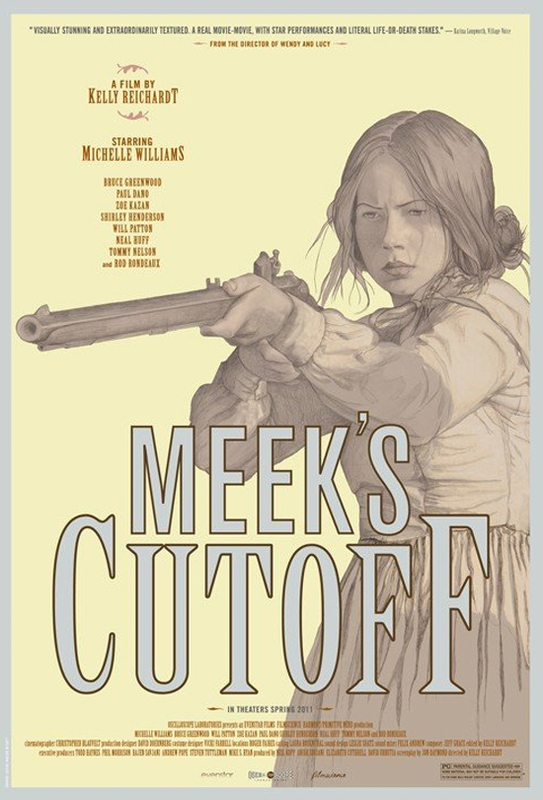 I am not sure that Meek’s Cutoff is a great film, though. I cannot say that it reaches some great truth, not without seeing it a second time. But what it accomplishes that so few other films do is create an entire world that they audience can enter. I’m not talking about the infinitely detailed worlds of Tolkien or Cameron, I’m talking about a world that can be fully experienced, without the help of 3-D, without the help of shaking seats, or mists and smells thrown at your face. The heat from the sun emanates off the screen. When the characters looks into their jugs, you feel just as thirsty as they do. This is an incredibly rare accomplishment. Is the movie slow and boring? Do you want to see it? I think by this point you already know. If you like sitting through the latest art-house treasures, you’ll probably love this. If you prefer the likes of the Green Lantern movie, or Pirates, or even Super 8 and that new-fangled X-Men, you might want to steer clear of it. As a person who enjoys both, from the moment the lights dimmed until the clatter of emptied seats, my eyes were glued to the screen. Not because of good performances, or great truths, but because the film, like the prose of McCarthy, managed to use its various machinations to reflect the hopelessness of the world its characters are forced to live in. I never noticed how difficult the film might be to others, because in the film, life is difficult. It took me to another place for 90 minutes, and in many ways, that’s all I can ever ask of the cinema. This entry was posted in Reviews and tagged arthouse, Kelly Reichardt, Meek's Cutoff, Michelle Williams, Period Piece, Western. Bookmark the permalink.